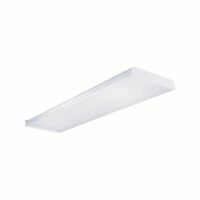 Low profile, narrow wrap light fixture, 2 light, 32 watt. White steel housing and clear prismatic diffuser with white metal ends. Diffuser hinges from either side for easy mounting. Uses 2 each F32 T8 lamps (not included). Energy star qualified, meets new energy legislation requirements. 48-1/4" x 7-9/16" x 3". 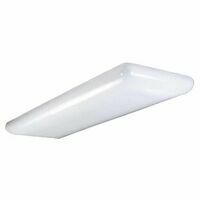 Low-profile, linear fixture with durable white acrylic diffuser. 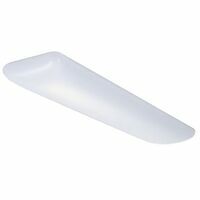 Thermal formed diffuser. One piece contemporary design wraps around the diffuser to soften the appearance. Surface-mount residential and light commercial applications. All mounting hardware included. CUL Listed.